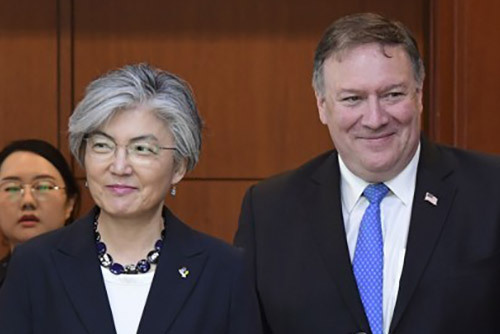 Foreign Minister Kang Kyung-wha is seeking a meeting with U.S. Secretary of State Mike Pompeo this week. Foreign Ministry Spokesman Noh Kyu-duk revealed in a regular media briefing on Tuesday that Kang hopes to hold a series of meetings with her counterparts, including from the United States, while she attends a foreign ministers’ conference in Warsaw from Wednesday. The spokesman said if a meeting between Kang and Pompeo is arranged, possibly on Thursday, they will likely discuss issues regarding an upcoming second summit between the U.S. and North Korea. An official of the ministry said Kang is also seeking to attend a three-day security conference in Munich from Friday.